This research investigated experiences of physical activity among people who have acquired sight loss later in life, to inform policy and practice. As well as physically active and non-active participants, a range of formal and informal physical activities – beyond ‘organised’ sport – were included. Physically active older adults have lower risk of disease, higher levels of physical and cognitive function, psychosocial well-being and independence than inactive older adults. 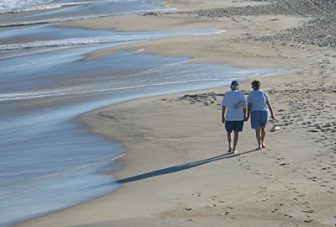 However, less than 10% of those over 55 years meet the minimum amounts of activity recommended for health. Further, visually impaired older adults, in general, have poorer health than the sighted population. Sight loss is also a significant risk factor for additional medical conditions, activity limitations, and participation restrictions. Knowledge on this specific group needs developing to make meaningful changes in activity levels and subsequent health and wellbeing. This program of social research will benefit visually impaired older adults by increasing knowledge and understanding of their participation (or lack thereof) in physical activity. This knowledge will have positive implications for the promotion of health and well-being within this population, and has relevance for formulating policy recommendations based on examples of good practice. To enhance the impact of this research, we are drawing upon the expertise of our Advisory Board which includes representatives from Volunteer Cornwall, the Cornwall Blind Association, the English Federation of Disability Sport, AgeUK, the School of Sport & Exercise Sciences (University of Birmingham) and the participants of the research. This research is funded by the Thomas Pocklington Trust, the University of Exeter Medical School and the Peter Harrison Centre for Disability Sport at Loughborough University.